So I had a fantastic afternoon at Fortnum and Mason yesterday meeting fellow bloggers who have all been busy baking for Christmas. This was the brain child of the lovely and very hard working Vanessa Kimbell, author of Prepped, a book which I think is now going to make it onto my Christmas list for its beautiful pictures and lovely recipes. I met so many people that I spend my days tweeting with like Karen and Lavender and Lovage, Ren Behan, Urvashi Botanical Baker and Laura from How to Cook Good Food. I definitely plan to make some of Laura's ginger Cordial. I also met lots of bloggers I haven't spoken to before such as Hannah from Corner Cottage Bakery. We all brought along our home made gifts for swapping and to enter into a competition. There were lots of fantastic entries and the competition was very still but my chutney at least got shortlisted to the Dan Lepard tasting stage. This is what I took along for the swap and competition. The Christmas Cranberry Chutney (making a 2nd batch this morning). White Chocolate and Cranberry Cookies and my special Christmassy Orange Mince Pies. I didn't manage to see who went home with my gifts so I hope they will get in touch. There are some people I didn't get round to meeting last night but funnily enough all the gifts I drew out from the draw were from people I had spent a long time chatting to. These were all people I had never spoken to on the blogosphere before. I receieved these beautiful glittery star Cornish Fairings from Ella who write The Lost Art of Eating and this lovely Mulled Wine Syrup which I may have to try tonight! My last gift was Apple, Cranberry, Fig and Walnut Chutney from Julia at Eat Healthy But Tasty. 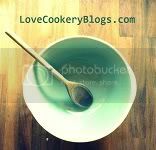 I am really looking forward to following Julia's blog as I am good at cooking baked goods but really needs some inspirational help for my health dinners. I also want to point out these gorgeous truffles made by Laura at Craftstorming. There are absolutely gorgeous. I make truffles every year but mine are always a bit rough and ready looking, even though they taste fab. I might be leaning on Laura to share her skills so I can one day be this good! Just to finish up here are some of my favourite things form the Fortnum and Mason displays. I have to confess I did spend £10 on the most wonderful chocolates. I will blog these in a separate post. All in all, a fantastic event and huge thanks to Vanessa for arranging it. I really loved the opportunity to meet like minded blog and twitter friends. Sounds like a fab event. Enjoy your lovely gifts. The pis looks great, think I'll have to drop in to Fortnum & Mason before Xmas. It's been a weekend of feeling green with envy! Hearing what fun you all had at F&M and now so many bloggers at BitenWrite. Next year, I must make at least one foodie blogging event! Love your swaps and will be investigating the blogs you mentioned. Well done on getting through to the Dan Lepard judging. Sounds like a fantastic event. Bet you're feeling very festive now! Just wanted to say how lovely it was meeting you yesterday. It was a real pleasure and if you are ever in my area please let me know so we could meet for a coffee! Hi ! I am the lucky recipient of your lovely Cranberries and White chocolate cookies. They are really nice ! I had a really good time on friday's afternoon too. I hope we can all meet up again soon! Guess what, I was the VERY lucky recipient of the truffles by Laura at Craftstorming, and they are delicious! A GREAT write up Kate, I need to do mine soon! Wasn't it a great afternoon. I missed meeting you, next time I hope! Your gifts look lovely, both the one's you brought and the one's you took home. Great meeting you on Friday, love the photo of the moose! Ahh, I've been admiring those mince pies and how beautifully they were packed on the day and subsequently on other blogs. Now I know whose they were. I guess the colour was a clue which I didn't follow - doh! It was such a fun event. Good to meet you, however briefly. Great write up Kate. It was lovely to meet you and such a great event. Thank you for mentioning my truffles, I'd be happy to give you some tips - in person if you fancy a trip to Southampton some time. Hope to see you again soon.